While I'm thrilled the warmer weather is here and I don't have to suffer through snow and freezing temperatures anymore, the tradeoff is the oil slick that my face becomes because of the heat. I already have oily skin, so add humidity and heat and it's a recipe for a makeup meltdown. Thankfully however, I have a few products that help me manage. Almost all of these products with the exception of one new discovery have been my favorites for years. I have reviewed most of them multiple times over, but felt it was necessary to compile them in one post for reference. 1. Murad Oil-Control Mask - This is my newest discovery, but since it comes from the Murad Oil-Control line, I knew I was in good hands. Like with most mattifying or oil-control masks, I need to use them sparingly so as not to dry out my skin which in turn makes it more oily. I love using this mask 1-2x/wk and find that it does wonders for me if I use it in the morning. Rather than putting it over my entire face, I apply it only on my t-zone and my skin stays much less oily throughout the day. 2. Murad Oil-Control Mattifier - I'm sure this one is no surprise to any of you following my blog for the past few years - I swear by this stuff! I love it as a makeup primer before I apply foundation and it does wonders to help me stay matte for 8-10+ hours. What makes this better than other mattifying priming products is that my skin still looks fresh and healthy after it's applied, instead of flat and dry. I will never be without this in my summer skin routine. 3. Tatcha Pore Perfecting Sunscreen - I discovered this last year when it launched and was immediately blown away by how it looked on my skin. Not only does it provide sun protection, but it helps my foundation last longer, mattifies my skin and blurs imperfections. But to be honest, I have yet to try a Tatcha product that didn't blow me away. The entire line is perfection. (Currently loving this serum and eye serum from them). 4. 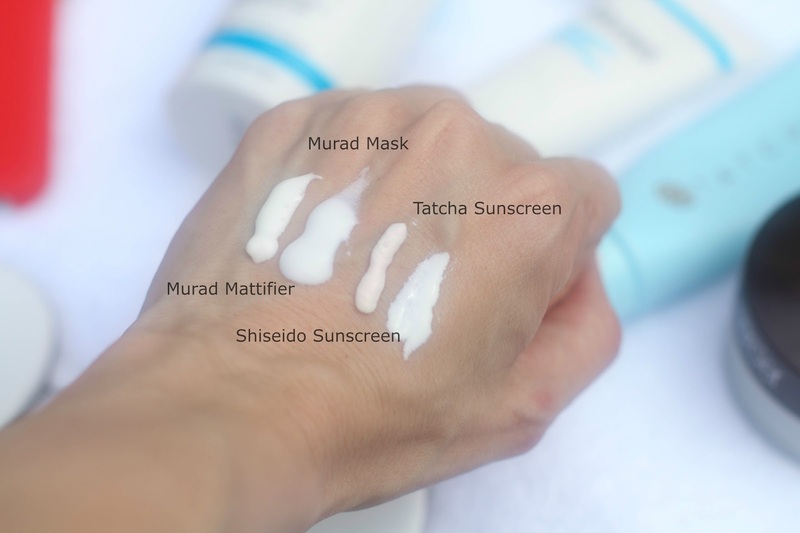 Shiseido Urban Environment Sunscreen - Before I discovered the Tatcha SPF, I was crazy for (and still am) this sunscreen. Initially because of its runny texture, I was afraid it would be greasy and do the complete opposite of what I wanted. But thankfully, I didn't let my first impressions stop me from trying it. My skin looks beautiful after applying, and any makeup I put on top lasts all day long. It is a bit more matte than the Tatcha so if it's going to be super humid out, I will reach for this SPF first. 5. Laura Mercier Universal Invisible Loose Powder - If you are a Laura Mercier lover, than you know this powder. It is a staple of her collection because of it's ability to mattify the skin and set makeup, but it also made a name for itself because of how invisible it is on the skin. For being such a stark white powder, it disappears into any skin tone from very fair to deep. I use it with the corresponding powder puff and find that pressing it into the skin makes all the difference. 6. By Terry Hyaluronic Hydra Powder - I was happy with my Laura Mercier powder and was not looking for anything to replace it. Then I had the opportunity to try the By Terry Hyaluronic Hydra Powder and it was game over. My Laura Mercier had some serious competition. While the Laura Mercier was amazing at mattifying the skin and making my makeup last all day, the By Terry powder did both of those things and blurred imperfections. After pressing this into my skin, I find that pores appear minimized and my face looks like velvety perfection. And just like the Laura Mercier powder, this looks great on any skin tone without leaving an ashy finish. Let me know what are some of your favorite mattifying products?! I am always looking for new ones to try. I love the sound of that Murad Oil-Control Mattifier, I'll be checking that out. Thanks for the tips! I agree with the Laura Mercier powder, the best. I definitely want to try some Tatcha products! I have very oily skin with enlarged pores and I was thinking about trying the Murad Oil Control Mattifier but I have a question. Can I use it under a mattifying sunscreen? It's currently Summer here in Portugal, and the weather is always very hot and somewhat humid. Thanks!! 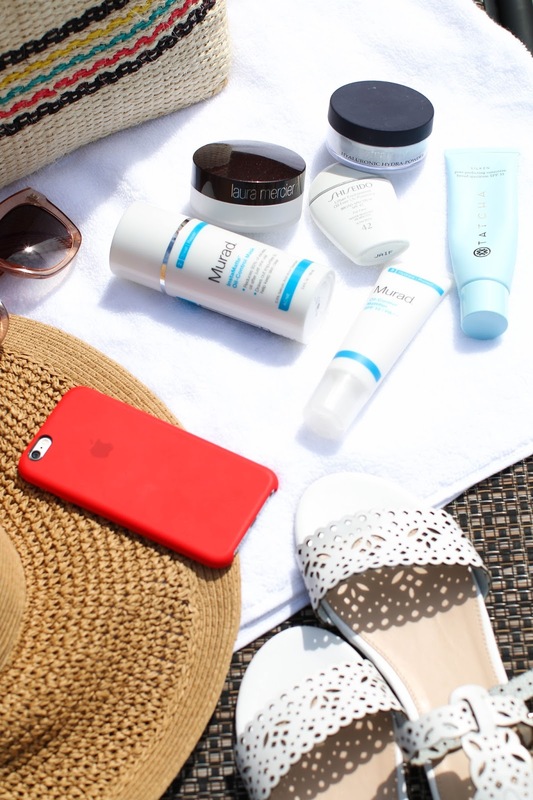 I would recommend using the Murad Mattifer on top of your sunscreen - I tend to use this as my primer under foundation. But there is no reason why you can't use it under a sunscreen as well - it would work well either way. Thank you so much for your reply. I've been watching your videos on youtube and I've already learnt so much.